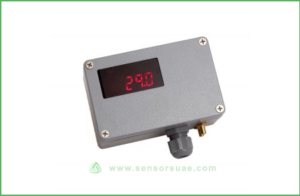 Pressure difference sensors are used to monitor the difference in pressure between two rooms, across a wall etc. Other terms for this system are negative pressure monitor, positive pressure monitor etc. 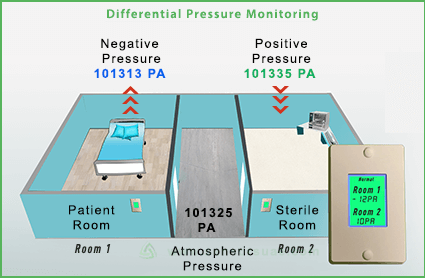 Patient isolation rooms in which a slight pressure difference has to be maintained. Specialised research rooms in which controlled conditions are maintained. Clean environment rooms and clean rooms in which pressure need to be maintained at certain levels. Medicine process rooms which are controlled for pressure, humidity and temperature. Sterilized plants or rooms which have to keep slightly negative pressure. Intensive care unit (ICU) for critical patients. Decontamination rooms for preventing contamination. Pharmaceutical special rooms for processing medicine items. Low-pressure monitoring for various other industrial applications. High-pressure monitoring for industrial applications. Central sterile supply department (CSSD) area in Hospitals. Normal type of installation is on a wall across two rooms having different pressure levels. If the door is opened the pressure will be different. In order to avoid false alarms, a delay can be programmed. Also, there are different models which can monitor three pressure levels across three rooms. There are two pressure ports which can be connected to silicon tubes across two walls. The device can be connected to existing Building Management System (BMS) through Ethernet, WiFi or BACNet or similar automation protocols. The device is completely standalone and the monitoring and alert system is not dependent on the computer network or Building Management System. In the case of a pressure difference, local audible and visual alarms will be generated. Also, auxiliary NO/NC contacts are available which can be connected to external alarms or other devices. 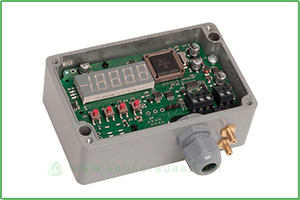 A local audible alarm which will generate loud alarms if the proper pressure is not maintained. Local visual alarm with a strobe having a flashlight. Email alert which can generate emails to operators. Alarm, siren or buzzer at any desired place such as a control room, distant from the monitored area. Monitoring through a computer screen in a central display room or any other place. 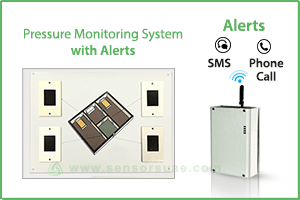 Monitoring and alerts through centralized BMS system of the building. It will have different options to connect to a serial port, RS 482 port etc. Phone call and SMS alert system which can make voice calls and SMS to 4 operators. The system can be calibrated to NIST standards. Special pressure differential monitors are available for explosive atmospheres as well. Also, we supply various pressure transmitters. In case you require complete pressure control through VAVs, we undertake complete design and automation of the same. In such case, the pressure sensors will continuously monitor the room pressure and will adjust VAVs. If you require monitoring of pressure in clean rooms, we have a complete clean room monitoring system which includes Interial Air Quality. Dear Sir, Our office is already in touch with you. Should you require any further assistance, please chat through the chat window in this page. We are looking for differential pressure monitor for our Emirates Dermatology And Cosmetology Center. Please give your best price for the same from your side.